Corsi must have an attorney akin to Rudy Giuliani. Aren't there laws against filing frivolous suits? Check out Charlie Savage's Twitter thread on the subject here. Right-wing author Jerome Corsi claimed that he was going to be filing a “criminal complaint” with the U.S. Attorney General’s Office against Special Counsel Robert Mueller‘s office on Monday morning. Since criminal complaints are filed by the government (not individuals) with courts (not an AG’s office), this led to some confusion. 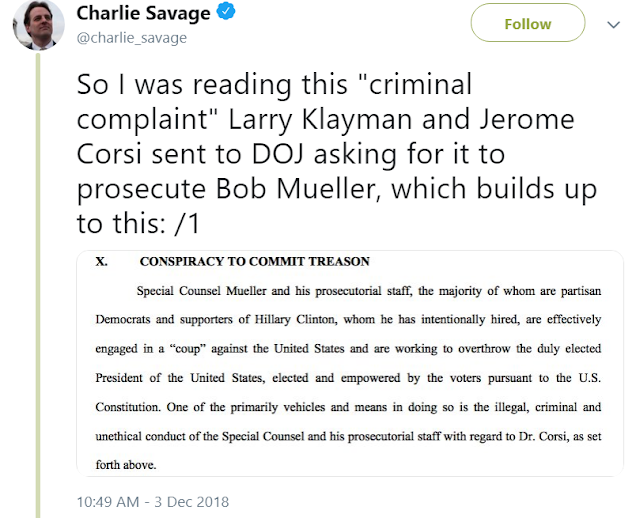 Well, Monday morning is here, and so is Corsi’s “complaint,” so let’s break down the main points of what it is and what he’s alleging that Mueller’s office has done to warrant it. 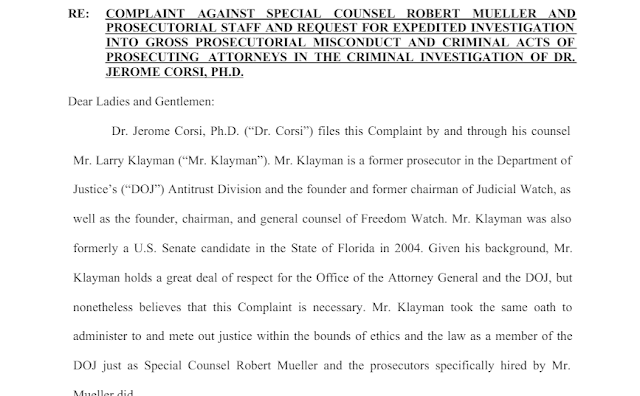 This document is a letter from Corsi’ attorney Larry Klayman, to Acting Attorney General Matthew Whitaker, the D.C. Bar, and various Justice Department officials, requesting an investigation. Klayman’s letter explains that Corsi did not have any special advance knowledge of the emails like those of Clinton campaign chair John Podesta from WikiLeaks or Julian Assange, rather he pieced it together by going through Hillary Clinton’s hacked emails. Don't laugh. He's obviously very brilliant. He hired Klayman. The letter accuses the Special Counsel Press Office, specifically spokesperson Peter Carr, of “orally leak[ing] grand jury and other confidential information to the media, avoiding any written record of the leak.” The letter cites news articles referencing anonymous sources as evidence that the Press Office leaked information about the focus of Mueller’s investigation. Presumably he doesn't say how he knows Carr leaked information, and Carr's office declined to comment when asked by Law & Crime. A great deal of Corsi’s allegations surround what he claims was an effort by Mueller’s team to have him lie about ties to Stone and WikiLeaks as part of his guilty plea. Corsi alleges that Mueller committed witness tampering and obstruction of justice by trying to coerce him to give false testimony. By allegedly threatening to prosecute him if he did not comply, Mueller and his team allegedly retaliated against a witness, in violation of 18 U.S. Code § 1513. Also mentioned is conspiracy to violate securities regulations because Mueller allegedly wanted to keep Corsi’s plea secret, even though he’d have to report it to the (Financial Industry Regulatory Authority) FINRA, because he holds a securities license. Corsi takes a cue from President Donald Trump, alleging that Mueller and his team are saddled with conflicts of interest and are unfit to work on this investigation. These conflicts includes some of their past political contributions to the Democratic party. Corsi specifically takes aim at prosecutor Jeannie Rhee for her past work for the Clintons. He claims that because she worked for Trump’s 2016 opponent, Rhee would not be willing or able to investigate evidence against Hillary Clinton or the Clinton investigation. Jeannie Rhee’s previous work for the Clinton Foundation and the Clintons would prevent her from exploring evidence or explanations that might point to criminal or even unethical actions of the President Trump’s [sic] adversary in the 2016 campaign, including alternative explanations of allegations, the $12 million that Hillary Clinton’s campaign trolled through the Russian intelligence community through the law firm of Perkins Coie and former British spy Christopher Steele. Gee, I wonder who put him up to veering from complaints about his own treatment to attacking Mueller about Hillary, which is not even an issue assigned to the special prosecutor in the probe? Now the “complaint” takes a turn by pointing to the Uranium One story, where several government agencies in the Obama Administration approved the sale of a significant amount of the U.S. uranium production to a Russian government-owned company. Clinton, who was Secretary of State at the time, has been accused of being influenced by Clinton Foundation donors with ties to Uranium One, the company purchased by the Russian firm Rosatom. Again, this ignores the fact that Mueller’s investigation is about Russian interference in the 2016 election and possible Trump campaign ties to such interference, not the 2010 Uranium One deal. Corsi also claims that the reason why he’s been targeted by Mueller’s team is because of his politics. Finally, Corsi lobs a grenade in the form of accusations of treason. And here's the "complaint" if you care to read it.